Growing potatoes “above” the ground. Potatoes don’t actually grow naturally deep in the ground and will tend to grow either very near the surface or partially protruding, so why do we grow them in the ground? Very simply it’s to prevent them being green. Growing them above the ground will produce the same yield, cleaner spuds with none of them speared, reduce pest problems, prevent a lot of unwanted weed growth, protect the soil structure and make your life easier. Personally I prefer to grow my veg. in long beds with a width of anything from 1 to 2 metres with paths in between; this makes “no dig” an even better system as the growing area is never walked on, any weeding etc. being possible from either side. 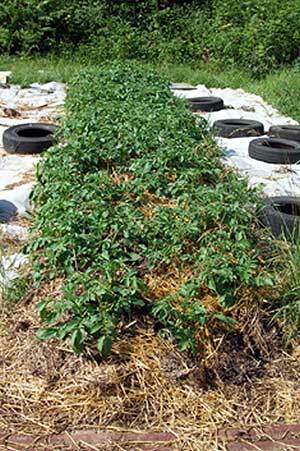 If you don’t use this system you can still grow potatoes above the ground. 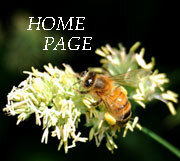 Ideally, prepare the ground in the autumn with a top dressing of compost and / or manure very lightly scuffed in. I either cover my beds in winter with old corrugated metal sheets, thick cardboard or black plastic or grow autumn sown field beans to prevent nutrient loss and also to suppress weed growth, worth considering if you don’t already do this. Chit potatoes in the normal way early in the year. When it is time to plant, lightly scuff the surface of the soil again and place the seed potatoes in little scooped out hollows in the surface, don’t cover with soil. Then cover the area where the potatoes are with straw to a depth of 15 to 20 cm. 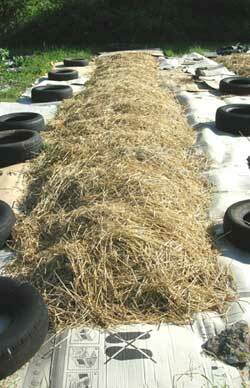 Hay or dry grass could be used instead, but not heavy, soggy grass cuttings at this stage. When the plants have pushed through by about 15cm but before they become too dense, fill in around them either with more straw or grass cuttings, this can be a lot denser as the tops of the plants will remain clear and in the light. Other than watering, that’s it. Moisture retention will be much higher than “normal” and temperature under the heap will be fairly constant. The straw will become a habitat for all sorts of creatures; most of these will be predatory and provide good pest control. Eel worm in the soil will not be a concern. Damage from mice etc. will probably be about the same. Harvesting is really easy, work your way along removing the straw picking up the potatoes; dig about in the surface, which should be loose, for the hidden ones with your hands, rubber gloves or “marigolds” are useful for this as it can be a bit soggy. The straw / grass cuttings, which have already started to break down, are simply spread evenly across the surface of the bed and left, these will gradually be worked into the soil. 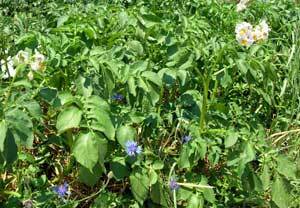 Once again a green manure could be sown, either something like buckwheat as an autumn crop to bind and hold the nutrients in the soil with its mass of fine roots or field beans to over winter.